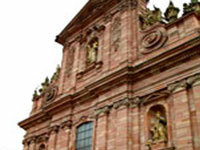 The historic university town of Heidelberg, about 55 miles (89km) south of Frankfurt, is billed as a city of music and romance. It is one of the few German cities that escaped relatively unscathed from air raids during World War II, and still has numerous buildings from the Middle Ages and Renaissance to explore, including some beautiful historical churches. The university was established in 1386, and features some picturesque buildings on its campuses. A good way to enjoy scenic views of Heidelberg is along the Philosopher's Walk, a path alongside the Heiligenberg, so named because university professors would walk along the path when they needed to think. The city is built along the banks of the Neckar River, and has a vibrant atmosphere thanks to its large student population, particularly in the student quarter with its narrow streets and lively inns. The modern part of the city, around the Bismarckplatz, has some good hotels and restaurants, and enticing shopping plazas. The weather in Heidelberg is famously sunny and warm compared to much of Germany, and this is a major draw for the millions of tourists who visit each year.